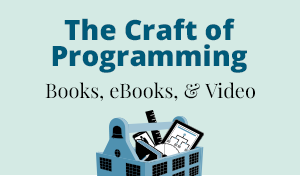 We have a long history of publishing classic content on Java programming from the best authors in the industry including Josh Bloch, Brian Goetz, Cay Horstmann, and Marty Hall. Shop the most popular and latest tutorials, references, and guides on Java below, or see the entire list here. Free Webcast! Pattern-Oriented Java Concurrency in Java SE 7 and SE 8 with Doug Schmidt (1 hour). Provide your email address and get access to the webcast today. I understand I am subscribing to InformIT and its family of brands mailing list. I may unsubscribe at any time. Privacy Notice. Josh Bloch shows eight ways to maximize the benefits and minimize the complications of generics in Java. Displayed prices reflect our everyday savings price and are subject to change. Any discount codes used during checkout are applied to list price not sale price.